This article is about two 1999 crop circle formations, illustrated above, that revealed an underlying design behind the triplet numbers, 111, 222, 333, 444, 555, 666, 777, 888, and 999. The theories presented in this article are not dependent on who or what created the crop formations in question. In any case, it is likely that the creative source of the ideas presented resides in the collective unconscious. Forms of art in general probably come from the same source -- dreams, visions, inspirations, and the like. This article makes a case supporting the theory that scientific ideas are helped along by an unknown control system. It may be that we are seeing a similar phenomenon in the form of crop circles. People around the world have been reporting frequent coincidences of seeing triplet numbers over and over again. Most often, the triplet numbers 111 through 555 are "sighted" on digital clocks of various kinds, but the triplets also appear in other ways, such as, on time cards, odometer readings, license plates, money transactions and dreams. Many report seeing the numbers on their clocks on awakening from dreams. After a time, many people become convinced that such coincidental experiences are beyond mere accidental, meaningless coincidence. A significant proportion of those experiencing number coincidences report that the phenomenon seems to occur at times of life-altering changes. The changes may be traumatic or happy. There may be disturbing stress followed by a positive conclusion. The most common "coincidental" number reported is 11:11. The next most common are the "triplets." The numbers 23 and 12:12 are also reported. Dee and I have been recording the reports of number coincidences for many years. We attempt to find the meanings of the various numbers through research, including our dream research. The two 1999 crop circle formations indicated that the triplet numbers have a relationship to the ancient Gematrian number system. One of the formations had 288 small circles, the other had 156 small circles. The total of the two amounted to 444 circles. The triplet numbers, such as 444, appear in other systems of Gematria. In the ancient system, the number 288 had the "Alpha" or "Word" meaning, "Double Light." Teachers of the Kabbalah tell of the 288 sparks of holiness that fell into the mundane reality following the shattering of the vessels of the world of Chaos, and the rectification (Tikkun) and elevation of the 288 Divine sparks. The vessels are the spheres of the Tree of Life. The rectification represents a repair of the Tree, which will bring an ideal world. Some say there is a Spark of the Divine within every human being. In 2005, several other crop circle formations matched closely with the geometry of the two aforementioned 1999 formations. The so-called "quintuplet set" type crop circle formations, which resemble the "five" on dice, are related to the geometry of the 1999 formations. The quintuplet set formations are one of the most common types, and have been appearing since the late 1980s. The formation that appeared at Hundred Acres in 2005 suggested an additional meaning -- the creation of reality in each moment through the Divine Breath. In an incredibly strange twist, a UFO sighting inserted itself into the middle of the story. This was followed by an additional crop formation in the form of an "X" that strongly supported the Divine Breath interpretation. The geometry of the Hundred Acres formation is also found in one of the large land glyphs on the Nazca Planes. A crop formation very similar to the one on the Nazca Planes appeared at Blackland (Morgan's Hill), Wiltshire, in the year 2000. While writing this article, I happened to find an article with a similar theme. It is about the communication between theoretical physicist, Wolfgang Pauli, and psychiatrist, Carl Jung. The primary subjects centered around the dreams of Pauli, and his "obsession" with the number 137, as it relates to the fine-structure constant. I have included a few links to articles about various events where the triplet numbers appear. A compelling example is the 777 New York City firemen who died in the line of duty prior to the terrorist attacks on September 11, 2001, and the 343 (7 x 7 x 7) New York City firemen killed on that one day. The first crop circle in question appeared at Windmill Hill, Wiltshire, around July 19, 1999 -- pictured on the left, below. It had 288 small circles. Around August 4, 1999, the related formation appeared at West Kennet Longbarrow, Wiltshire -- pictured on the right, below. It had 156 small circles. The West Kennet Longbarrow formation fits within the Windmill Hill formation, therefore I saw the pair as symbolically "female and male." The West Kennet Longbarrow formation looked like a pyramid as viewed from above, with four smaller pyramids attached to the corners. For these reasons, I came to call the patterns "quintuplet pyramids." The number 444 and the other triplets are often reported by people to appear in coincidental ways, as if "something" is trying to get their attention. We started collecting pages of such reports in 1996 and continue to do so. The number 11:11 is the most commonly reported "coincidental" number. The triplets are the next most common. Our files with these reports are here. Squares and cubes are thought to symbolize Earth and/or the earth plane reality. The number four obviously fits well with the geometry. The quintuplet pyramid formations, therefore, may represent something about our reality. It may be significant that they seem to suggest a fractal nature. The "male" or "key" formation had two sizes of circles (see diagram above). There were 120 smaller and 36 larger circles for the total of 156 circles. In each quadrant there were 30 smaller and 9 larger circles, as if to emphasize the number 39. Note that the number 288 falls on one point of the yellow star. A single star divides the 360 degree circle into five parts of 72 degrees each, giving the series, 72, 144, 216, 288, and 360. With two stars, the circle is marked at 36, 72, 108, 144, 180, 216, 252, 288, 324, and 360. The numbers continue with more revolutions around the wheel. For example, the second revolution marks the numbers 396, 432, 468, 504, 540, 576, 612, 648, 684, and 720. The number 39 can be 3 x 13 or 2 x 19.5. I realized this because of dreams of sheets of paper specified in the dreams as being 8 1/2 x 11 inches (8.5 + 11 = 19.5). The perimeter is obviously 39 inches. The number 13 is used by the Maya in their very accurate timekeeping. The number 13 is found in playing cards. It was used by the Founding Fathers in establishing the USA. It seems likely that this also corresponds to the Tribes, the Zodiac, and related symbols, as 12 in a circle, with One in the center. Some call this shape a Merkaba or Merkabah. It is said by many to be Ezekiel's "wagon" (four living creatures). Merkaba is said to mean: Mer = Light, Ka = Spirit, and Ba = Body. The 3, 6, 9 skip sequence is easy to see in the 13 and 37 multiples. Note the addition of "mirror" numbers 432 and 234 and their total, 666. The number 432 is a universal cycle of time number. The ancient Gematrian Alpha/Word meaning was "Consecration." The number, 666, of course, is in the Book of Revelation (13:18), and is well known throughout the world. Interestingly, the magic square of the sun is based on a 6 x 6 grid of the numbers 1 through 36. Each row, column, and diagonal adds to 111. All the numbers add to 666. Each set of opposing corner numbers add to 37 (1 + 36 and 6 + 31). The temperature of the body is said to be 37 degrees Celsius, which is 98.6 degrees Fahrenheit. The conversion from Fahrenheit to Celsius starts with subtracting 32 from the Fahrenheit temperature, which results in the "coincidental" number 66.6. Five-Ninths of 66.6 complets the conversion to 37 degrees Celsius. The number 504, in the ancient system, is related to 5040, a number used by Plato in describing Atlantis. The factorization of 7 (expressed as 7!) equates to 5040 (1 x 2 x 3 x 4 x 5 x 6 x 7 = 5040). The same number is a measure in the New Jerusalem Plan diagram, composed of the combined radii of the Moon and Earth (1080 + 3960 = 5040). The number 5040 is also used in calculating 31680, the sub-lunar distance around the New Jerusalem. The number 31680 is also six miles in feet (6 x 5280). Interestingly, the diameter of the Earth in miles is 8 x 9 x 10 x 11 = 7920. The matching number for 351 in the last row of the table of triplets, is 648, which is also special. Twice 648 is 1296, six to the fourth power (6 x 6 x 6 x 6). The number 1296 is one tenth of the number of years in half the precession cycle through the Zodiac Ages (25920 / 2 = 12960), or six Zodiac ages (6 x 2160 = 12960). The precession was calculated by the ancients to be the movement of the solstice and equinox positions of the sun along the horizon amounting to one degree in 72 years . A complete cycle takes 25920 years (72 x 360). It is thought to represent a tetrahedron, a three-dimensional, three-sided pyramid. "In traditional cosmology, 31680 miles was taken to be the measure around the sub-lunary world, and early Christian scholars calculated the number 3168 as emblematic of Lord Jesus Christ. The same number was previously applied to the name of a leading principle in the pagan religion." Some years later, I realized that the angles to the ratchet spiral suggested half the precession number, 120 x 108 = 12960. The six arcs of the ratchet spiral may represent the six Zodiac ages, from Leo through Pisces (6 x 2160 = 12960). After Pisces, of course, comes the Age of Aquarius. Various dreams, visionary experiences, and myths suggested that the Barbury Castle pictogram represents the smallest particle of consciousness and matter, also known as the "consciousness unit." The number 1296 is, of course, twice 648, which was the length in feet of the 1996 DNA crop circle. There were 144 curved lines within the tube torus type shape, 72 in one direction, and 72 in the other, making up the net-like pattern, which resembles snake skin. The twisted ladder type pattern, which resembles the double helix of DNA in a circular design, was composed of 504 little diamond shapes of standing crop. There were 792 little diamond shapes in the torus with laid down crops (504 + 792 = 1296). The blue circle represents the Earth, with a diameter of 7920 miles. Each of the twelve yellow circles represents the Moon, with a diameter of 2160 miles. The perimeter of the red box around the Earth circle is 31680 miles (4 x 7920 = 31680). The New Jerusalem plan diagram is based on the vision of Saint John the Divine in Revelation 21, and represents the order of the heavens made apparent on earth. The four triangles or Trigons making up the twelve-pointed star represent the four types of signs: fire, air, water, and earth. Each Zodiac sign is represented in the Bible by one of the twelve Tribes, as described by the camp positions of the Tribes in Numbers 2. The four living creature are featured in Ezekiel 1 and Revelation 4. As stated previously, the four living creatures are Ezekiel's "Wagon" -- the Merkaba or Merkabah. When the planets are aligned with the four major Zodiac signs, it is called a Grand Cross Alignment. I first read about ancient numbers in 1990. A small number of them were discussed by Joseph Campbell in his last book, The Inner Reaches of Outer Space. I learned much more in 1994, when I I began to read the work of Carl Munck. In one of Munck's Pyramid Matrix newsletters, there was a short list of the ancient numbers, along with their Alpha or Word meanings. The number 144 had the Alpha/Word meaning, "Light," and 288 had the meaning, "Double Light." Around 1999, I received an e-mail from mathematician, Jerry Iuliano, concerning the number 82944. Jerry referenced a web page article by Professor D. G. Leahy, titled, "82944 & The Four Fundamental Forces & The God Particle." I studied all of Professor Leahy's articles and later bought his book, "Foundation: Matter the Body Itself." I found this a remarkable and meaningful coincidence. Professor Leahy mentioned the fine-structure constant in his article about 82944 and in the Golden Bowl Structure article. Remember, the number 82944 is the square of 288, which was the number of circles in the female pyramid quintuplet crop formation that appeared at Windmill Hill in 1999. About a week after this observation the writer had a dream. In his dream he was in a large hotel looking for a room. The room number on his key was 2808. He was having a great deal of difficulty finding this room. He asked some vaguely defined hotel person for help. He was told he was on the wrong floor and that he needed to go down 2 floors. But when he went down the 2 floors he still couldn't find room 2808. He discovered that he was now on the 27th floor. He failed initially because he had been on the 29th floor. Because of the peculiar elevator arrangements in the hotel in the dream he had to go down to the lobby and start all over in his attempt to get to the 28th floor. At this point he woke up. This relates to Nebuchanezzar's dream in the Book of Daniel, where the great tree was cut and banded, causing a period of insanity for seven years. As reported above, the other triplets are multiples of this basic set of numbers. To me, this is an amazing example of how dreams and crop circle formations are related. It follows a trend I have been recording and reporting since 1990. Gematrian type numbers are often involved. It seems to me that Professor Leahy's dream may have intended the multiples of 13 to be put together with multiples of the special number 288, which has a relation to the fine-structure constant, in order to form the triplet numbers. The dream reality is an incredible source of information. It may be that dreams are the "Hall of Records" that certain people hope to dig up. Apparently, what is required is to dig down into the collective unconscious of mankind. Unfortunately the grand meanings of dreams are being ignored by mainstream society in our time. I discussed this subject in more detail in a 2009 radio interview. Remember, the number 144 is an ancient Gematrian number meaning "Light," and its double, 288, means "Double Light." Also, the similar 1999 female quintuplet pyramid crop formation had 288 little circles. The mitochondrial DNA crop circle formation of 2002 had a snake skin design, formed by 144 arcs. And, the number 288 and its square, 82944, is related to the fine-structure constant in the work of Professor Leahy. I colored elements of the formation in red to show the similarity to the splice box and Navaho sand painting. The illustrations depict four couples around a square. Interestingly, there were four couples aboard Noah's Ark -- Noah and his wife, and his three sons and their wives. The number eight is often said to represent a new beginning. Many similar patterns appeared as crop formations in the year 2000. The shapes symbolize how the creation is created in each moment through the Breath of the Compassionate. The star portion is the outward breath. The "X" shape is the inward breath (see the Extra Data section for details). Following the various crop circles discussed in this article, and similar findings elsewhere, I am led to speculate that the Sufi concept of how the creation is created relates to Professor Leahy's concepts about the fine-structure concept, which is fundamental to subatomic physics. The important conjunction here is about the creation itself. In 2005, I posted some of the information about the Hundred Acres crop circle formation on the Crop Circle Connector Forum. The image had that pyramid look, which reminded me of the 1999 male pyramid quintuplet. Incredibly, the shape was quite similar to the "X" part of the Breath of the Compassionate! The image on the far right, above, is the one most similar to the UFO sighted and painted by Liz. Clearly, the symbol represents the inward breath, confirming its counterpart -- the double boxes that appeared at Hundred Acres as the outward breath. As I mentioned near the beginning of this article, the most commonly reported number coincidence is 11:11. The words of Ezekiel include -- ". . . when they stood still, they let down their wings." This seemed similar to my idea about lowering the bases of the triangles. 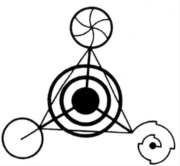 As I mentioned above, the Barbury Castle pictogram may represent the smallest particle of consciousness and matter, also known as the "consciousness unit." When the two pyramid quintuplet crop formations appeared in 1999, I realized that the geometry fit well with my version of "Ezekiel's Wagon," and Vincent's images, above. The graphic on the right, above, is the simplified form of the four Barbury Castle triangles as Ezekiel's Wagon. It can be interpreted as the center circle representing the Sun, and the outer circles as the yearly four solstice-equinox positions of the Earth. In My universe there is but one form from which all forms appear. That one form is the pulsing cube-sphere, two halves of the heartbeat of My dual thinking. All forms pulse, therefore, all forms are two, one form for the inbreathing pulse, which generates, and one for the outbreathing, radiating one. The cube is the sphere expanded by the outward breath to black rest in cold space, and the sphere is the cube compressed to the incandescene of white-hot suns by the inward breath. For, to thee I again say, all things are Light; and Light separates not; nor has it bounds; nor is it here and not there. Man may weave the patterns of his Self in Light of Me and of his image in divided lights of Me, e'en as the sun sets up its bow of many hues from divided Light of Me, but man cannot be apart from Me, as the spectrum cannot be apart from the Light of Me ... Verily, I say, every wave encompasseth every other wave unto the One; and the many are within the One, e'end down to the least waves of Me. In two dimensions, the cube is represented by a square shape, and the sphere is represented by a circle. The Female Quintuplet Pyramid crop circle formation that appeared at Windmill Hill in 1999, fits this picture. It had the square shape of the pyramid, with its 288 little circles, inside a large circle. This is yet another hint that the crop formations are conveying a message about creation itself. As I was researching and writing this article in January, 2010, I found a pdf file article online about the communication between theoretical physicist, Wolfgang Pauli, and psychiatrist, Carl Jung. The primary subjects centered around the dreams of Pauli, and his "obsession" with the number 137, as it relates to the fine-structure constant. This was quite an important find for me, as it seems so similar to the subjects in this article -- especially the 2808 dream of Professor Leahy and his work about connections between the number 288 and its square with the fine-structure constant. In this paper we analyze in detail the central role of number '137', the so-called Fine Structure Constant in the collaboration of Pauli and Jung. First, we present the fascination or the obsession of Pauli for the interpretation of number '137'. Second, we treat the spontaneous messages originating from unconscious concerning number '137' in the well-known dreams of Pauli. We restrict our investigations to the dreams containing the especially important formulae of Fine Structure Constant (4Pi3 + Pi2 + Pi), and also that contain the so-called background models of mathematical control systems. Third, we shortly mention four of the numerous synchronicities arising during the Pauli-Jung collaboration. Furthermore, besides Pi, sufficiently (according to certain alchemical and traditionally hermeneutical rules) it contains only the first four integer numbers. The first three (as powers) have some "generative characteristics" but the fourth one (4) with certain topological characteristics (as a multiple) also meets the usual "symbolic demands". The crop circle formation with the 288 little circles is placed to the right, for comparison. The concept of squaring the circle is also mentioned in the article. On the other hand, Jung emphasizes that the dreamer (Pauli) has a highly biased intellectual modality, and does not possess any (deeper) knowledge of mythology, mystics, or religions. It is important for Jung to emphasize the spontaneous formation of those dreams that are connected to alchemic and cabbalist motifs. However, as it was demonstrated earlier in this paper, the number archetype had a decisive effect on Pauli in his student years, and exactly, in connection with the co-occurrence of word 'Cabbala' and number '137'. Moreover, the well-known conversation11 between Victor WEISSKOPF, a leading physicist and a former assistant of Pauli and Gershom SCHOLEM, one of the most eminent scholars of Jewish mysticism is also clearly imply the direct connection between number '137' and Cabbala. Debbie said "Qabalah" is correctly spelt with a "Q," (rather than with a "K") and is a Hebrew word meaning "to receive" (i.e. knowledge). Greek Gematria gives the word the number 137. (spelt backwards - HLBQ - H=5, L=30, B=2, Q=100). The Hebrew word for "wheel" also adds to 137. The Kalmanian view of systems and their models , , besides the usual dichotomic reality and description/model "attitude" use trichomic paradigm. It means that besides the (in itself unknowable) "reality" - which is characterized by a certain kind of measurement data - the theory postulates hypostatized system classes (using a neutral language of conception), furthermore, constitutes, as a third entity, the model classes related to the former classes of systems. Our intention is to demonstrate the "background" forms of mathematical system theory both in Pauli's dreams and in the writings of Pauli and Jung, with a special emphasis on the controlling/regulating principle. While Jung intuitively hypostasize the self-regulating psyche, and stress on the regulating principles, therefore one can perceive a kind of geometric system theory with the adoption of the significant concept of 'projection'. Pauli instead emphasizes the role of iso- and homomorphic relations, algebraic groups and automorphisms that is he intuitively formulates the cognitive basis of background algebraic system theory. "As a consequence of the rationalistic attitude of scientists since the eighteenth century, the background processes that accompany the development of the natural sciences, although present as always and of decisive effect, remained to a large extent unheeded, that is to say, confined to the unconscious. On the other hand, in the Middle Ages down to the beginning of modern times, we have no natural science in the present-day sense but merely the pre-scientific stage, just mentioned, of a magical-symbolical description of nature. This, of course, is also to be found in alchemy, the psychological significance of which has been the subject of intensive investigation by C. G. Jung. My attention was therefore directed especially to the seventeenth century, when, as the fruit of a great intellectual effort, a truly scientific way of thinking, quite new at the time, grew out of the nourishing soil of a magical-animistic conception of nature. Pauli postulates a transcendental background, an "informational cosmos" (symbolically returning to the "concept" of Anima Mundi - see e.g. ) which is the (probabilistic) basis of both physics and psychology, or the subject of both theological and mythological ways of cognition; in which the physical, mental, and spiritual layers create a unity on the basis of a transcendental informational and control language, cf. . This "background" (from which the white noise "steps out") is called by the authors Pleromatics (after the Greek word ~~~~~~~), and "contains" only symmetry structures and related abstract fields of random variables or fields of contingency without any direct information about the space-time continuum. So, the human recognition concerning the above processes - according to Pauli - formulates dynamical control systems of informational type, where one can not preclude the possibility of personal connections of dynamical systems. These can be discussed as a relatively natural and artificial competence in the form of mythological, theological, psychological and biological recognition. The presence of regulating (control) systems can be shown in all of them on the level of both natural and artificial competence. This can be traced in on the level of natural competence in mythology and theosophy as the directing dynamics of the pleromatic world, e.g. in the sephirotic system of the Cabbala. A good example of artificial competence regarding this is Paul RICOEUR's "control-theoretical" hypothesis regarding the magical-mythological ideas, the hermeneutics of meaning, and the Jewish-Catholic religion . In physics artificial competence appears in the control-theoretical and informatical interpretation of Schrödinger's equation, at the same time, it can be discovered in Pauli's dreams, reflections and conscious works corresponding to background control. Pauli's aim was to establish connection with those cognitive and emotional unconscious processes bearing a transcendental-type and maybe personality which are in tight connection with the evolution of natural and artificial competence of mankind in these fields in a constant interaction. In this aim, new in its own reflection, an idea of central importance which can really be observed in the modern scientific concept in the Jung-Pauli relation. According to both Jung and Pauli the number archetype is '137' above all, and in tight connection with it the interpretation of the number '137'; and in connection with this the mathematical system theory, as well as the use of the control-theoretical paradigm. "My feeling is that the common ground shared by physics and psychology does not lie in the parallelism of the formation of concepts but rather in »that ancient spiritual 'dynamics' of numbers that you point out on p. 295. The archetypal numinousity of number expresses itself on the one hand in Pythagorean, Gnostic, and Cabbalistic (Gematria!) speculation, and on the other hand in the arithmetical method of the mantic procedures�"
The word numinousity indicates the power or presence of a divinity. "An important detail in this thinking about duality is the meaning of the numerical value of the electric charge which in the form of Sommerfeld's fine-structure constant is approximately 1/137. Pauli repeatedly stressed that progress in quantum field theory was linked to an understanding of this number [�]. But the number 137 also had an irrational, magic meaning for Pauli; it was the room number 137 in the Red Cross Hospital in Zurich where he died on 15 December 1958. The enigmatic conjecture that the observer in present-day physics is still too completely detached also has a meaning beyond physics. Indeed, in his article for Jung's 80th birthday, Pauli compares the observational situation in physics with that in psychology: Since the unconscious is not quantitatively measurable, and therefore not capable of mathematical description and since every extension of consciousness ('bringing into consciousness') must be reaction alter the unconscious, we may expect a 'problem of observation' in relation to the unconscious, which, while it present analogies with that in atomic physics, nevertheless involves considerably greater difficulties. For Pauli this analogy had implications in both directions: On the one hand, in the concluding remarks of the birthday article for Jung, he expresses the expectation that in the future the idea of the unconscious should emerge from the purely therapeutical realm and become more a problem of objective research. On the other hand, he thought that in physics the remedy for the too complete detachment of the observer may lie in the integration of the subjective, psychic. Indeed, in Science and Western Thought Pauli asks the question: Shall we be able to realize, on a higher plane, alchemy's old dream of psycho-physical unity, by the creation of a unified conceptual foundation for the scientific comprehension of the physical as well as the psychical? This quest for a unity of physics and psyche is a recurrent theme in the exchange between Pauli and Jung and is the main concern in Pauli's Background Physics in which he was guided by his dream motives (Hintergrundsphysik)." To me, the idea of the "control system" discussed in the article fits with other ideas about how our reality works. As I see it, the "control system" is in the dream reality. It is as if our daily lives are a stage play, where we follow the "script" written in the dream reality. There are scripts for individual lives, and on collective levels, including a world level. This is the basis of "evolution" in various terms, as change is a constant process. Such a process is evidenced by the worldwide phenomenon of shamanism. The shamen have a close connection to the dream world, and help their tribes in adjusting to change. In modern society, it is generally the artists that perform a similar function. We all have a bit of the shaman in us, that is, we are all connected to the dream reality. It seems clear that certain people with great intellect, such as Pauli, manage to tap into the dream-unconscious realm, helping them to bring new ideas and changes to the world. 666 - Coincidence, Omen, or a Blessing? To the Sufi, creative expression which results from participation mystique -- that is, a state of being one with nature, although not conscious of the Divine Presence - is an expression of one's vision of self within self. It is an expression which is not reflective, not polished, not aware of the total possibilities inherent in the nature of things. It is only through conscious expression that one has the more perfect vision of self reflected in the qualities of something else. The only way that expression can serve in its full capacity is when it is reflective; it becomes reflective only when conscious of the Divine Presence. The reflective surface now reflects something which is contained, a Spirit which is not only one's own. This is the Spirit which is universal to all things; to the Sufi, it is the 'desire' which exists within things 'to be known'. The Breath of the Compassionate. The preparedness within a thing, it's inner Archetype, is actualized in an intelligible form at the moment when its Name flows into it through a Word. The Divine Spirit or Logos flows into a thing through the process of the Divine Breath, the Breath of the Divine name Rahman, Compassionate. The Name of the Compassionate manifested through the Divine Breath, is just one of the many symbolic processes which the traditional craftsman emulates. By blowing or chanting the Divine Names upon the form to be transformed, the creative process of the breath, which contains the Divine Presence through a Name, transforms the object in hand. The creator participates as active agent and the object participates as passive recipient. There is a Tradition of the Prophet in which he says, 'God created the universe through the Breath of the Compassionate.' The Compassionate (Rahman) is the highest of the Names, Ideas or Archetypes. 'Where was your Lord before creating the visible Creation?' someone asked the Prophet. His answer: 'In a cloud. There was no space either above or below.' This cloud which the Divine Being exhaled, and in which it originally was, receives all forms at the same time as it gives beings their forms. It is the act of making things to exist. The Absolute, appearing in the Name, Compassion, overflowing with goodness, gives existence without limit and without end. When the desire to be known, the preparedness, arises within a thing, the Divine as Compassion extends Itself as Archetype to the thing and becomes its receptivity, its ability to receive the theophany. This receptivity is actually what the Archetype, in its state of concrete essence, desires. Therefore, the actual effect of Compassion is to give a thing the possibility of receiving sensible existence. Compassion is given without any discrimination; Mercy, the complement, is given only for an act done. Compassion, in a sense, is the universal form of Divine giving; Mercy is the particular aspect. Through the Name of Compassion, the Absolute breathes out upon the other Names or Archetypes. This breathing out is a means of being things into existence. By means of the Command 'Be!' the Absolute through Compassion sends into the external, phenomenal world that which has been compressed within it. The Divine Breath pervades the Universe. Just as breath is exhaled and so forms syllables and words, the Breath of the Compassionate, in exhaling Words (intelligible forms), brings the sensible form into being. This Divine Breath is Nature itself, just as the Breath contains all the forms of the universe in a potential state and actualizes them by exhaling, so Nature holds all forms of expression in a potential state of preparedness in which they await the appearance of the Breath of the Compassionate, the Spirit, the Logos, in order to be known. This breath is essentially the initial act of the metaphysic of love. Love is the cause and secret of all creation and thereby the principle of all motion from desire to being known. The creation of the world, in this sense, was the motion of love towards perfection and completion. The Absolute loves to be perfect in both types of forms: intelligible and sensible. Ultimately, one who wishes to know the Breath of the Compassionate need only know Self, for Self is the Lord who is manifested in the form. One's innermost being is most directly expressed through speech. Speech on the human plane reflects the Divine Word or Logos; it was the Word that create the universe and it is through the Word that it returns to God. Invocation (zikr) is the means of reaching the very substance of things within us. The universe, in the Sufi view, is being re-created at every moment. At every moment what appears to be a time-connected universe returns to God. There is continuous, instantaneous expansion and contraction. The circles are called Sephiroth. A single circle is called a Sephira. The spelling of the names vary. Kether, Hokmah and Binah, in Jerry's article, refer to spheres 1, 2 (Chokmah), and 3, above. Hesed is circle 4 (Chesed). Tzimtzum (Hebrew "contraction" or "constriction") is a term used in the Kabbalahistic teaching of Isaac Luria, explaining his concept that God began the process of creation by "contracting" his infinite light in order to allow for a "conceptual space" in which a finite and seemingly independent world could exist. 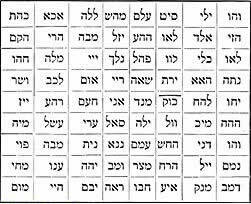 This contraction, forming an "empty space" in which creation could begin, is known as the Tzimtzum. Isaac Luria introduced three central themes into kabbalistic thought, Tzimtzum, Shevirat HaKelim (the shattering of the vessels), and Tikkun (repair). These three are a group of interrelated, and continuing, processes. Tzimzum describes the first step in the process by which God began the process of creation by withdrawing his own essence from an area, creating an area in which creation could begin. Shevirat HaKelim describes how, after the Tzimtzun, God created the vessels (HaKelim) in the empty space, and how when God began to pour his Light into the vessels they were not strong enough to hold the power of God's Light and shattered (Shevirat). The following excerpt is reprinted from Signs and Symbols of Primordial Man by Albert Churchward, a student of the European Egyptologist Gerald Massey. According to John Henrik Clarke, in his introduction to the volume, "(Massey)" was an agnostic whose intention was to prove that the basis of European culture was created outside of Europe by people that some Europeans later characterized as savages without a history or culture. His search led him to Egypt where he found proof that Western culture was, in fact, African in origin, the larger portion of it coming from the Nile Valley . . ." About the Pyramid of Giza, built by ancient Africans, Churchward writes: The Great Pyramid, when understood, far surpasses and ellipses King Solomon's Temple as a building, or any other in the world . . . The base is a true square, and perfectly oriented, set due N.E.S.W., parallel with the equatorial line, absolutely no variation of points; its base on huge rock and that rock perfectly and truly hewn and levelled (sic) to the earth's curvature of 8 inches to the mile, the importance of which is evident-keeping it from convulsive damages as time goes on. The height of the pyramid is . . . 486.256 feet...., and each side is . . . 763.81 feet. The height thus measures, with the radius of a circle whose circumference equals the four sides . . . showing that the circle could be squared by these ancient architects which has not been improved on since. Its base side length is 365.242 sacred cubits, showing the number of days and fractional part of a day in a year. Here, in the Great Pyramid, is the one material centre (sic) which gives the standard for those practical things -- weights, measures, etc., and these were carried from land to lands, with the utmost care by the Priests who left Egypt, no doubt for some future purpose under divine will, which is not yet apparent. The builders of the Pyramid were masters of Astronomical and Geographical science, and it contains the minute measurements of the earth and heaven, far exceeding the scientific knowledge of any man in our own time, and this knowledge and the secrets thereof were known to the High Priests, and they carried their knowledge wherever they went. The Ark of the Covenant, built in the wilderness by Moses, Noah's Ark and King Solomon's Temple, all bear a true decimal proportion to the Pyramid, and the "Ark" or "Sarcophagus" in the King's chamber within the Pyramid. Note: Another source of information on the contributions of Africans to the Nile Valley is Egypt - Child of Africa, edited by Ivan Van Sertima. The vessels of the upper three Sephiroth -- Kether, Hokmah and Binah, at first performed well in the task of holding the light, but when the light poured down through the lower vessels, from Hesed through Yesod, these six lower vessels shattered (Shevirah) and were dispersed into the chaotic void of the tehiru. This was the Shebirat-ha-kelim, "the breaking of the vessels". The original vessels were in what is now the world of Atziluth, but when the light from above penetrated the Sephira Malkuth, this shattered into 288 sparks which failed to return to the primordial source but instead fell through the worlds, and became attached and trapped in the broken fragments of the vessels which formed the kelipoth (or Qlippot), the "shells" or "husks". These husks became the evil forces of the Sitra Ahra, the "other" or "under" world, preventing the return of the sparks of divine light to its source. Thus the light or energy of creation "fell into matter". . . . . at first performed well in the task of holding the light . . . (this is the idea of the transference of energy from energy to light, defined by the "holding / non-holding" allowance of the fine-structure constant or the amplitude of an electron to emit (non-holding) or absorb (holding) a photon (light) . . .
. . . This was the Shebirat-ha-kelim, "the breaking of the vessels" . . . (Shebirat-ha-kelim is the action of the fine structure to retain stability of the "broken vessels" or allowances made for orbital change of the electron) . . .
CHEOPS PYRAMID WITH LIGHT/BODY 37 . . . The meaning of 37 as the bridge between the philosophy of the "broken vessels" and physics can be demonstrated by the representation of 37 as the Kether or real body of the Jewish messiah (Christ ?..reference the book THEOMATICS by Jerry Lucas where he specifically assigns the value of Christ as 37). Christ or the Messiah, the body 37, rules over the pyramids (Cheops constructs) and over the Judaic mythology of the 288 "sparks from broken vessels". Christ's connection to this form is through the fact that 37 and c are mathematically distributive when used in the cosine fine-structure form. This is the only pair that can distribute to the cosine or halo of light or the only pair that can "punch" into and out of the Sitra Ahra shield. Switching c and 37 and cosineing (halo) the result creates unity (1) God. These values are exact to the centerline values of the 1998 NIST standards for fine-structure. SEPHIRA MALKUTH'S FORM BEFORE "SHATTERING"
draw another circle a 1 / 4 inch outside the kelipoth and label the ring -- Sitra Ahra which is bi-polar, plus and minus, good and evil etc. on the outside of the second ring plot six points representing the factors of the fine-structure constant; e, e, 2, E, h and c which also represent the six "broken vessels" in the shape of the star of David. draw another circle 1 inch from the second ring and another circle 1 and 1 / 4 inches from the second ring; this ring represents the Sephira Malkuth. Everything between the Sephira Malkuth ring and the Sitra Ahar ring represents the tehiru. draw another circle 1 / 2 inch from the outside Sephira Malkuth ring; this represents the Atziluth. In the Altizuth space plot the six factors of the fine structure constant (six "broken vessels"). This represents the pre-stage of the unbroken vessels before they pass through the Sephira Malkuth to reality. Connect the "unbroken vessels" outside the Sephira Malkuth to the "broken vessels" that sit between the ring of Sephira Malkuth and the ring Sitra Ahar with a jagged line. ( e to e; 2 to 2; E to E; h to h and c to c. The three original vessels -- Sephiroth Kether, Hokmah and Binah sit outside the Atziluth ring. These represent the quark forms 1 / 3. Eddington's number 136 can be shown to be a deeply unconscious number form that I believe came into his collective unconscious through an alchemical inspirational mind experiment. In his initial paper he thought that the number was important and then created this matrix of logic to describe this number exactly. What I believe happened is that he was a mystic . . .
. . . and had dabbled in the pentagonal geometries of the black arts, pentagram etc. However the most incredible thing is about his original inspirational number 136 is that he UNCONSCIOUSLY knew that this number is 100% correct in it's original inspiration even though he was humiliated by his incorrect interpretation of the number concerning fine-structure as shown in his original paper when it was experimentally found that the fine-structure constant was closer to 137 than 136. This tells me that he was given this information as if in a dream or trance (some visual of the number 136 or something ). He was so inspired by the intensity of the 136 integer that he "created "the matrix logic that led to his wrong interpretation of the 136 integer as it pertains to the fine-structure constant . So to me it isn't his interpretation of the original integer (136) that is interesting ( his "poetry" ), it is the fact of the number itself having such an influence on his psyche. The proof of this assertion lies in the alpha particle , the nucleus of a helium atom from Rutherfords brilliant gold foil discovery of the " bullet of the experimenter" -- the alpha particle in 1910, and its place in the scheme of things relating to electrical and nuclear phenomena. Eddington made his fine-structure constant prediction in his 1938 paper. He was humiliated .
. . . Eddington's original intuition (dream number ? ) for 136 is 100% accurate to modern measured values of these physical constants! These objects are not mathematical objects -- they actually exist in Nature and are measured almost yearly somewhere on earth in different laboratories. There is no way that Eddington could have guessed this number correctly to such an extremely high accuracy in 1938, beating by more than eight decades, modern measurement studies that match exactly, his original intuitive numerological number 136. There is no way this is a coincidence with this much accuracy shown in both constants. So the question should be not be the humiliation of Eddingtons mathematical "poetry" for the number but the number itself in its whole....136 ??? Interestingly, the number 136 is the sixteenth triangular number. This also means that the numbers 1 through 16 add to 136. The Dream of World Clock essentially contracts the dream of the four-eyed bear (dream No. 39) with the dream of the four rectangles forming a geometric quaternion (dream No. 51, see Fig. 4). The dream of two rectangles which we may derive the 32 + 4 + 2 structure from, has a further interesting dynamic feature. Namely, people move clockwise around the four colored waters in the middle of the four derived rectangles. In the centre, however, people move anti-clockwise around the asterisk. This contrary motion of the centre already refers to the connection between the energy and the controlling systems. The etymology of the English word 'control' is in complete consonance with the background control image of Pauli's dream. The word 'control' originates from the medieval let in expression 'contra rotulare' being the linguistic mapping of the dream image mentioned above. This feature synchronistically connects the four colors with the World Clock dream, the number '137' and the concept of control together with its dynamic system. The delineation reaches the English world control trough the English-French 'contreroller' and the French 'controlle'. 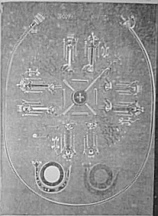 Jung rather frequently speaks about his patient's dreams containing symmetry structures which are very similar to the "Ezekiel pattern" without any knowledge of the vision of Ezekiel. He remarks that despite its significance in the spiritual history of the Christian-Jewish world, even among the highly educated people there is an almost complete ignorance "in this field". Jung classified this kind of dreams as Mandala ones, which can be experienced as certain psychic synthesis of a psychoid transcendental background and real psychic "foreground". Further-more, the appearance of the possible synchronistic phenomena was interpreted by him as the parapsychological equivalent of this transgressive totality (completeness) experience . "I have always been particularly interested to see how people, if left to their own devices and not informed about the history of the symbol, would interpret it to themselves. I was careful, therefore not to disturb them with my own opinions and as a rule I discovered that people took it to symbolize themselves or rather something in themselves. They left it as belonging intimately to themselves as a sort of Creative background, a life-producing sun in the depths of the unconscious mind. Though it was easy to see that it was often almost a replica of Ezekiel's vision, it was very rare that people recognized the analogy, even when they knew the vision -which knowledge, by the way, is pretty rare nowadays." Pauli probably was influenced by the concept of "creative background" from Jung's Terry Lectures (1937). Unfortunately, we have no possibility here to give even a short survey about the known analysis and interpretations for the symmetry structures of the vision of Ezekiel. based on accounts of Pauli's dream . "Dreamer is falling into the abyss. At the bottom there is a bear whose eyes gleam alternately in four colours: red yellow green and blue. Actually it has four eyes that change into four lights." Inasmuch the bear symbolizes north in mythology, as well as in astronomy and the Chariot of God arrives from north on the sky in the vision. The algebraic variation system of the four lights of the four eyes can be related in a natural way to the 4 + 16 + 256 system interpreted in the previous paragraphs. According to the parity conception of Pauli (right-left sides of space), the above structure can be simplified into 128 + 8 + 1 [= 137]. That is, the dream of Pauli connects the Merkabah vision with the fine structure constant - without any knowledge of mythology . In the dream of four rectangles (dream No. 51, see Fig. 4) beside the four colors we can identify 32 geometric elements (12 corners, 16 lines and 4 rectangles). It is originally formed from two basic rectangles, so the structure 32 + 4 + 2 is valid. "There is a vertical and a horizontal circle, having a common centre. This is the world clock. It is supported by the black bird. The vertical circle is a blue disc with a white border divided into 4 × 8 = 32 partitions. A pointer rotates upon it. The horizontal circle consists of four colours. On it stand four little men with pendulums, and round about it is laid the ring that was once dark and is now golden (formerly carried by the children). 2) The middle pulse: one complete revolution of the pointer. At the same time the horizontal circle advances by 1/32. 3) The great pulse: 32 middle pulses are equal to one revolution of the golden ring." The rotations define three rhythms that are in an order of powers: 1/32, 1, 32, 322. The archetype number of rotation (or the circle) is naturally the Pi. In the spatial structure - as Jung analyzes the dream - number 4 dominates over number 3 of temporality. The rotation itself symbolizes Time, in this manner the spatial and temporal structure of the Dream of World Clock is symbolically isomorphic with the formula of the fine structure constant a-1= 4Pi3 + Pi2 + Pi. Namely, the dream can be considered as a central algebraic (system) archetype, and at the same time, as an automorphic mapping of the cardinal number arche-type in the symbolic system of the dream. From the Pauli-Jung letters  it is clear that the black bird is supported by the female symbolic figure of anima, where anima is suited with number '7'. In this way the black bird (1), the rotating discs and ring (3), and the figure of anima (7) altogether associates to number '137'. Furthermore, the temporal structure (rotation scale) itself is double 32, and the spatial structure is also evidently 2 × (32 + 4) (the four little men with pendulums - horizontal disc, and four cardinal positions of pointers - vertical disc), that altogether results in 1 + 2 × 32 + 2 × 36 = 137. The dreams No. 39 and 51 naturally and evidently contained in the structure of World Clock vision (four little men, four colors create an isomorphic map with the four eyes and four colors of the bear). Therefore, the three power-like rhythms with the four space-like quaternio (like a multiplicator) is a natural and evident isomorphic map of the 4Pi3 + Pi2 + Pi = 137.036� Consequently, the structure of the World Clock vision (together with the dreams No. 39 and 51) is a perfect isomorphic structure of the above formula of fine structure constant and its discussed isomorphic interpretations (if Pi ~ 4 or Pi ~ 2). Jung often refers to the old familiar saying: on the Olympus numbers reign. Following this pattern, we regard the supreme ruler ("controller") of number archetypes the specific formula introduced for fine-structure constant. Remark. The interpretation of the four wheels in the Ezekiel vision with the (then usual) 8 spokes can ensure a structure number of '32 + 4 + 2' beside the above '256 + 16 + 4' one. Since the number of the Hebrew word for wheel (which is a fundamental concept in the tradition of Ezekiel vision) 137 . . . , so the isomorphy with the structure of World Clock vision and the formula 4Pi3 + Pi2 + Pi can be considered as a complete one. The interpretation of three rhythms and space quaternio also can be easily detected from the structure of the Ezekiel vision. (Other similar historical examples were mentioned in our earlier works [44, 45, 46]). From the point of view of the depth psychology the "numbers" 137 and 4Pi3 + Pi2 + Pi are the twin number archetypes of the Self (Selbst). In spite of the common exegesis of Sefer Yetsirah, it seems that the number of �32 Wonderous Paths� is not just the sum of the decade (ten) and the 22 Hebrew letters, but it also a whole and meaningful entity by its own. Even traditional interpretations for Sefer Yetsirah which explain �the 32 Paths of Wisdom� as different types of Sekhalim - �intelligences�  (such as of the RaABaD, and inadequate as they are), make no inner distinction of 10 and 22 among them. From pure numerological perspective, 32 is 2 at the 5th power. At the beginning of our discussion we have surveyed the five-fold pattern of the books of the Pentateuch and of the �worlds� in the scheme of the later Kabbalah. IF we note that the number 2, just like the letter Bayt which we discussed earlier, is the sign for division and discrimination, then the number 32 will serve well to represent the range of distinctions that are generated in the transitions between 5 worlds. Already in the hidden world of Adam Kadmon there is a certain distinction (signified by the letter Bayt as the beginning of the Book of Bereshit), for else it would not be possible to refer to it as a �world� that contains some components. This primary distinction is becoming more detailed in the world below it (Olam ha�Atsilut) into further distinctions[c]. These distinctions pass further division and distinctions at the world below it (Olan haBeri�ah), and so on at the World of Yetsirah-Formation and then in the world of Assiyah-Action, which is largely apparent to our senses, there are already 32 primary distinctions. The number 32 is associated with Wisdom-Hokhmah, precisely because it requires wisdom to observe the existence of the primary distinctions  as well as of the possibility of annuling these distinctions and return affairs to the state of Unity.
" A new research has determined the laws of Nature are the same in the distant Universe as they are here on Earth. The research was conducted by an international team of astronomers , including Christian Henkel , from the Max Planck Institute for Radio Observatory in Bonn ( Germany ). It shows that one of the most important numbers in physics theory, the proton-electron ratio , is almost exactly the same in a galaxy six billion light years away as it is in Earth laboratories- approximately . . . 1836.15. " On the right side Dirac speculated that cT=R ..where R is the radius(size) of the universe: R = the reciprocal of Hubble's constant. The divisor is the slassical radius(size) of the electron. Dirac's mystery was: " Why should the size ratio of the smallest and the biggest objects of the universe also be the ratio of the gravitational(smallest) and electrical(biggest) forces"
....this can be explained as the weak force times the constant for ordered bifurcation equals the mysterious ratio. This analogy can be extended and proved to be a "magical"
...this is exact to the electron value ...2010 NIST !! The unification of Pauli's dreams of the "world vision " clock rich in the symbolic number 32 , and his dream of the imaginary number i , the square root of negative one. This is a table within a table, with the border colors as white, the same as the background color.